Rev. Robert and Cynthia White will be our Youth Leaders for the Conference. Rob and Cindy have been married for 24 years, and both are privileged to serve as ordained Pastors in the American Baptist Churches. 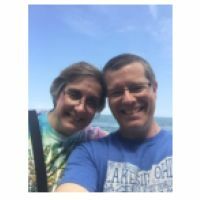 After spending eight years serving together on a church staff in Lima, Ohio, Rob is currently the pastor of First Baptist Church, Davenport, Iowa, while Cindy subs in the local schools. Both of them have a love for working with teenagers, and are most excited to have the opportunity to coordinate the youth ministry at the FABM week at Green Lake. Rob and Cindy have two kids: Ben is a sophomore at Miami University, and Abby is a junior at Davenport Central High School. Be sure to introduce yourself to them this summer: they look forward to becoming part of the FABM family!